If there is anyone out there who thinks of 5 Seconds of Summer as "that boy band that isn't One Direction but opens for them sometimes", then prepare to eat those words and convert to the fandom. During 5sos' performance at the Teen Choice Awards on Sunday night, they rocked the stage so hard that I'm still trying to process it. 5 Seconds Of Summer may feature a lot of young dudes similar to One Direction and other new-age pop groups that have burst on the scene recently, but they've got a fun, different, edgier style that provides a different kind of appeal to the audience. Plus they've got a one-up on their fellow groups: they also play their instruments, and quite well for that matter. Their performance was definitely rocking enough to turn any newbies into fans, but to be honest... I wanted a little more edge! 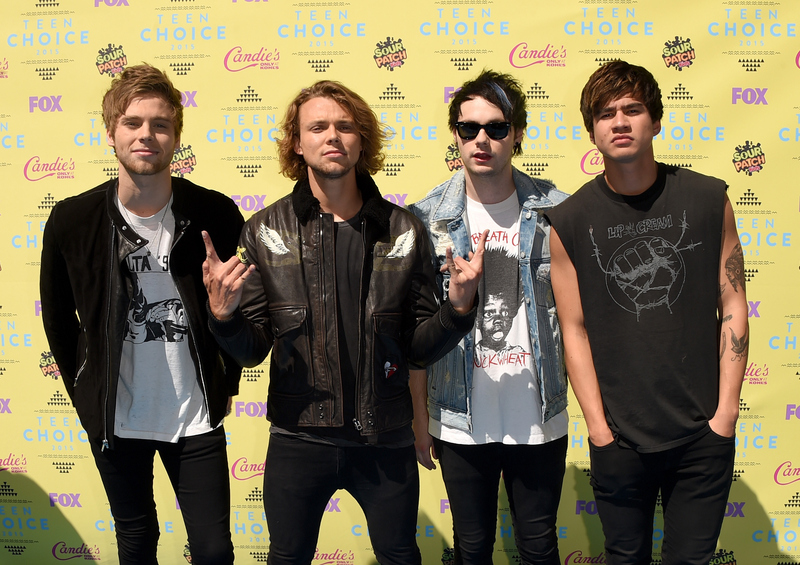 Along with performing on the awards telecast, 5 Seconds Of Summer was also nominated for three Teen Choice Awards: Choice Music Group: Male, Choice Song: Group for their single "What I Like About You," and, finally, Choice Male Hottie which featured fellow nominees Justin Bieber, Austin Mahone, Ryan Guzman, and One Direction and Zayn Malik as two separate entities (which still makes me a little sad). The band took the stage before any of their awards were announced, and they had the honor of being the very first performance of the night. It was definitely a great way to start the show as the guys performed their single "She's Kinda Hot," which features much more edgy lyrics than some of their counterparts including the lines "they say we’re losers and we’re alright with that. We are the leaders of the not-coming-back’s. But we’re alright though. Yeah, we’re alright though. We are the kings and the queens of the new broken scene." The guys all took the performance really seriously, but it's such a fun song and has a great rocking attitude that you can't help but dance and jam out to when you hear it. I get it guys, I get the appeal. Now I just need more from them, more rock, more edge, more attitude and more songs! Seriously, one song was not nearly enough. Check out the full performance in the video below.